Both the day’s operations reported by “Fliegerzielgeschwader Bongart” were over the Corrèze Département. A Go 145 made a further reconnaissance of the Ussel – Tulle area to support relief of the men in the tunnel at Le Lioran. The crew reported "dropping" near Égletons (a three-man “Jedburgh” team and 28 French SAS had parachuted in on the night of the 11–12th), blocked roads and blown-up bridges. No fewer than nine Ju 88 bombed south east of Murat, returning to report that “Lavassière” in fact Laveissière, 5 km west of Murat) was largely destroyed, artillery positions were silenced and that heavy casualties had been inflicted on the “terrorists.” Lavaeissière’s post office was hit but the inhabitants had taken refuge in the woods. In nearby Haut-Fraisse several houses were destroyed by fire. In Albepierre-Bredons, 4 km to the SSE, four year-old Jean Navarre ran outside to see an aircraft, which he remembered as completely black, passing low overhead. His grandmother, fearing retaliation, convinced the local Maquis not to open fire on it. Although the Ju 88 mission to Laveissière was said to be in support of the 157. Res. Div., that unit’s zone of operations was east of the Rhône and the attack on the village was carried out by the Brigade Jesser. Another Bongart aircraft (type not stated) reconnoitred Le Blanc airfield on behalf of Aerodrome Regional Command Orléans but saw nothing out of the ordinary. A single German machine bombed Sainte-Jalle, 70 km south east of Valence, and in Grenoble, Hptm. Karl-Heinz Müller of the Geschwaderstab was injured when the engine of his Go 145 failed on take-off. Around 10.00 [local time] an aircraft overflew Lac du Poursollet, 20 km SE of Grenoble, catching off-guard rmembers of the « Section Porte » Maquis. They were quickly taken under fire by ground troops and five killed and others wounded before the survivors took flight. Other air attacks in support of Hochsommer were made on camps at Cirque de Saint Même and the Massif de la Chartreuse. In Normandy, the German forces were now surrounded on three sides and fighting desperately to escape complete envelopment. The Geschwader’s assignments today were similar to those of the previous two days. Two Re. 2002 supported ground troops south east of Grenoble reporting “pockets of resistance silenced” and two Ju 88 returned to the Murat tunnel, again claiming heavy losses among the Resistance fighters. Also, three German reconnaissance aircraft were seen by Résistants over Montgirod in the High Savoie, prior to an engagement with German troops. 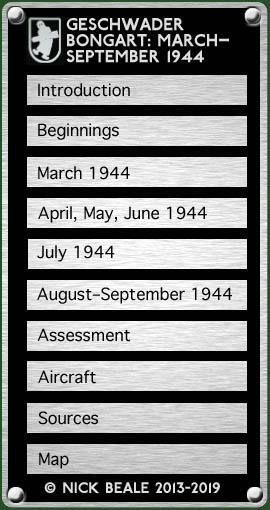 Bongart’s Operations Officer reported a raid on Lyon-Bron by an estimated 100 B-17s which destroyed a Ju 88, severely damaged a Ju 52 and caused slight damage to two Re. 2002 and a Fi 156. It is interesting that, two days after being told not to transfer to Lyon, the Geschwader should nonetheless have reported the loss of some of its aircraft there; in fact three Reggianes were found on the airfield by the Allies (and wrongly identified as Fiat G. 50s). At 16.00 hrs. the runways at Lyon and Dijon were reported out of action owing to bomb craters. Early in the morning, Allied forces landed on the French Mediterranean coast, between Toulon and Cannes. Aerodrome Regional Command 3/XIII in Lyon reported that Oberst von Bongart had passed on an order from Luftflotte 3 to re-equip a Gruppe for bombing. It was to be ready from the 16th and the Fliegerzieldivision reported that it had dispatched six Ju 88 crews and 10 bomber observers to Clermont-Ferrand. Bombsights, superfluous in target tugs, could have been re-installed in the Geschwader’s Do 17, He 111s and Ju 88s; the sights would have required personnel trained to operate them and this probably explains the dispatch of the additional bomber observers. According to the War Diary of the Kriegsmarine, 21 aircraft engaged “gangs” and supported friendly troops surrounded west of Murat. Luftflotte 3 reported that Geschwader Bongart had flown 12 anti-guerilla sorties, it did not name the target(s) but there is one salient candidate. The Battle of Égletons (the town was later awarded the Croix de Guerre) had its beginnings when a column of Sicherungs-Regiment 194 ensconced itself on the campus of the National Professional School, east of the town centre, on 4 August. 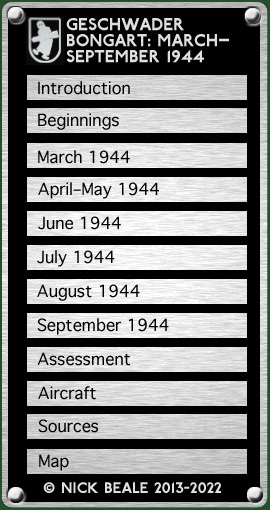 Nine days later the FFI called on the Germans to surrender but this was rejected and firing had broken out on the 14th. At around 08.30 (local time) on the 15th a German aircraft strafed and bombed along the avenue de la Gare. More aircraft (reported as Ju 88s) came over to attack with bombs and guns throughout the day. According to a communication from Field HQ and Aerodrome Regional Control, Luftwaffe Station Orléans was attacked on 15/8 by 100 enemy tanks and destroyed. Enemy east of Blois. Request authorisation for transfer of III. Gruppe and Geschwaderstab, if enemy threatens Bourges. Suggest Luxeuil. Clermont-Ferrand considered too near, Dijon unserviceable after attack. All communications destroyed. This probably refers to Bricy, about 12 kn NW of the centre of Orléans. The city itself was liberated on the afternoon of the 16th by 3rd US Army and resistance forces. “Kampfgruppe Bongart” was asked to send Oberst Hartl of Verbindungsstab Châteauroux by air to Avignon immediately, or to Lyon if that was not possible. (The Germans evacuated Châteauroux four days later). Total operations of “Fliegerzielgeschwader Bongart” were: five Re. 2002 bombing “terrorists” near Orléans; two Reggiane and a Ju 88 supporting German troops near Égletons; and two Re. 2002 on reconnaissance of the Orléans – Blois area. Aircraft from Clermont-Ferrand bombed Égletons early in the afternoon (although reported in the plural, this was presumably the one Ju 88 mentioned above) then, a little before 19.00 (local time) two “Focke-Wulfs” (almost certainly the Re. 2002s) dived on a lorry transporting FFI men across the place du Marchadial. Their bombs killed two men, completely destroyed one house, damaged other buildings and started fires. At least one aircraft loitered over the town for another hour, apparently trying to establish the resistance fighters’ positions of the fighters. Because the water supply had been cut, the fires became uncontrollable, gutting the town hall and burning until heavy rain helped extinguish them later that evening. Another bombing mission took place which is not identifiable from Bongart’s “total” above. 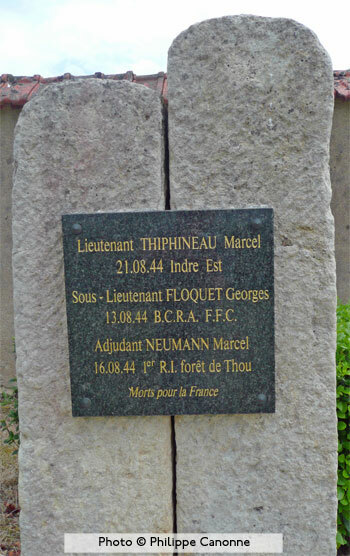 At a farm in the forest of Thoux, 25 km south west of Bourges, Adjutant Marcel Neumann was commanding a detachment of the French 1st Infantry Regiment. On this date the farm was bombed by German aircraft thought to have come from Bourges or Lissay-Lochy. After the first attack the group had dispersed but Neumann remained behind and was killed. The farm and the hutments there were destroyed in the bombing. A new entrant to the anti-Maquis war was II./JG 77, newly drafted in from Italy. From 15.25 hrs. seven of its Bf 109 G-6 were out to strafe guerilla targets near Saint-Remèze (35 km north east of Orange) where the Maquis had attacked an observer post overnight. They reported one passenger vehicle and a lorry shot up and set ablaze; fleeing “terrorists” fired on among trees and scrubland; and building and houses strafed, causing one fire.